Get Paid What Your Worth! 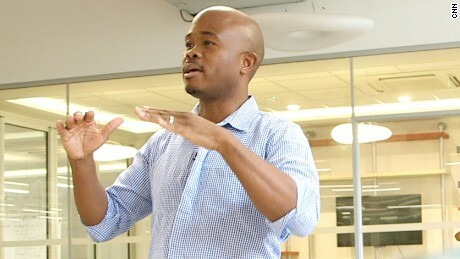 (CNN) At just 18 years old, Fred Swaniker became a head teacher. Since then he's built an empire that he hopes will enrich and empower the entire continent. "The greatest equalizer in life is education," Swaniker told CNN. "If you can give people a chance to get this education, then we can actually get people out of poverty, and into the middle class, and then eventually creating wealth for others." The Stanford Business School graduate, who has been commended by Barack Obama, founded the African Leadership Academy, a residential school for 16 to 19 year-olds in Johannesburg, South Africa. Swaniker is committed to investing in the next generation and empowering young people to be leaders, but his ambition goes beyond his students; he wants to revolutionize Africa. "I realized leadership was the single biggest thing that was holding us back from achieving our potential as a continent," he explained. "The idea... came to me, 'why don't I create a special school for leaders?' If you give a young person a chance to practice entrepreneurship at 17 or 18 in a small way, that will give them the confidence and the practice to do something much bigger." "Mark Zuckerberg started a little computer project in his dorm room when he was 19. That became Facebook." After Swaniker's father passed away, his mother decided to open up a school in Botswana. She was a popular teacher in their town, and started a school in a small church room with five students, making her son headmaster. "It was a lot of responsibility, parents were giving you their most valuable asset really their children. For me to look after and to mold their minds, and determine in some ways the path of the rest of their life." Within three years the school was doing better than its private competitors, after five the school was the best in the country. "The best advice my mother ever gave me... is that when you're building a great school, it's not about the buildings, not the facilities," he continued. "What makes a great school are three things - great teachers, great students, and [a] great curriculum." Now, Swaniker is embarking on a new adventure, providing students with the opportunity to split their education between the classroom and the real world. He founded the African Leadership University in 2013 in Mauritius, and hopes to open 25 campuses around Africa by 2060. "Our aim is to transform Africa by developing what we believe is our most precious resource, which is not gold, it's not oil, it's not all these minerals that we obsess about in Africa - it's the brains of our young people." "We've been missing the boat, and trying to dig up the resources underground. Our most valuable resource is above ground." Named one of 2016's most innovative companies by Fast Company, Swaniker sees the African Leadership University in Mauritius growing to 15,000 employees over the next 30 to 50 years. "I believe that the transformation of Africa is not a short-term game," Swaniker argued. "I think in Africa we too often focus on quick wins and short term fixes." "There is no short term quick fix to creating prosperity, and development and peace. You have to take the long-term view." Get Ready For A Life Changing Experience! Enter Your Name and Email Here to Get Weekly Updates On Our Show!